Pompey extended their advantage at the summit of League One with a 1-0 victory at Bradford. Gareth Evans’ first-half goal against his former club moved the Blues three points clear at the top of the table. The Bantams ended the clash with 10 men after Adam Chicksen was sent off late on, while Hope Akpan missed a golden chance for the hosts in stoppage-time. The game started at a quick pace, with Lewis O’Brien’s shot stinging the gloves of visiting keeper Craig MacGillivray on four minutes. And Pompey didn’t have to wait long for an opener, breaking the deadlock on 12 minutes. Ronan Curtis skipped past Ryan McGowan, before cutting back a cross from the by-line for Evans, whose right-footed shot from six yards found the roof of the net. Kenny Jackett’s men should have doubled their lead in the 28th minute. Tom Naylor’s header back across goal picked out Oli Hawkins but he steered his left-foot effort from close range over the bar. Bradford had a decent opportunity to level on 40 minutes, yet former Blues loanee Eoin Doyle’s shot was straight at MacGillivray. Pompey started the second half much the stronger side, with Curtis having a looping header stopped by Richard O’Donnell in the hosts’ net. The Bantams started to grow into the game, though, and rued a missed chance in the 60th minute. O’Connor was left unmarked from O’Brien’s cross, but his header was down MacGillivray’s throat. The hosts continued to search for an equaliser and in the 81st minute Chicksen’s dangerous cross was unable to be met by a claret shirt. Yet Chicksen could no longer have an impact on the game, after the 83rd minute when he was dismissed for a second booking following a foul on Lowe. 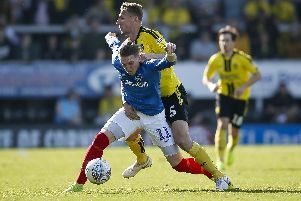 Pompey didn’t capitalise on their one-man advantage and David Hopkin’s side should have snatched a point in stoppage-time. Akpan burst through on goal but fired his effort from six yards over the bar. It was a let-off for the Blues, while Ball bent a free-kick with the last kick of the game just around the post. Pompey survived, though, returning to Fratton Park with a victory in hand. Jackett’s troops are now three points clear at the top of League One, after Peterborough were defeated at Wycombe.